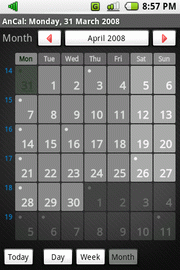 AnCal is Calendar application for mobile phones with Google Android operating system. 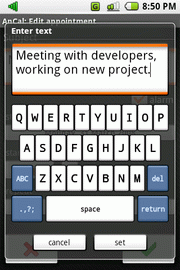 Calendar software is often called Personal Information Manager (PIM). 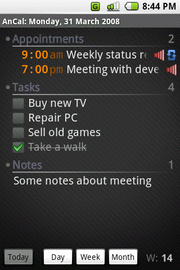 AnCal as a PIM software, helps individuals to keep organized everyday. AnCal stores yours appointments, tasks and notes, which you can easily add and edit. 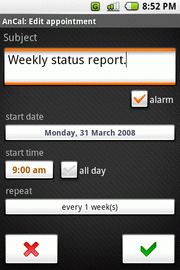 You can also set alarms for selected items and see day, week and month reports of your appointments. To see more, open tutorial's Quick Start and Tips pages.